CREATIVE SKILLS: Made by Me team members Rachelle, Ruby, Kendall, David and Shantelle at last year's exhibition. The team has a total of eight members, with two having joined this month. GLADSTONE Community Linking Agency's newest enterprise is proving to be one of the most popular yet. 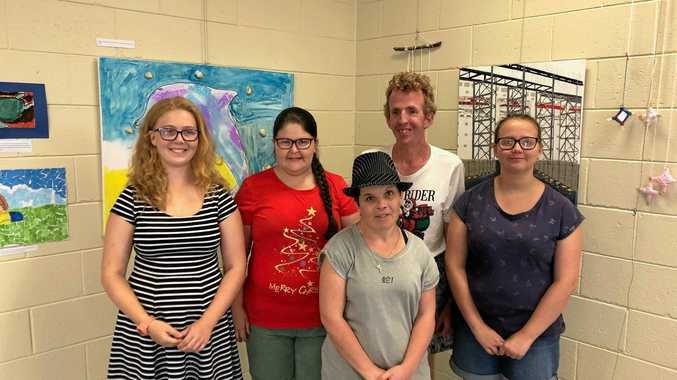 Made by Me is a GCLA art initiative based out of the Gladstone Community Hub which is owned and operated by the organisation for its customers who have a disability. The program is run by project delivery coordinator Mellissa Holzheimer. Ms Holzheimer said the arts and culture project had a group of eight who held their first exhibition late last year as a private one-day event for families, friends and GCLA staff. "Made by Me is a fun, hands on program that involves customers getting to experience learning about design whilst having the opportunity to create and make their own products," Ms Holzheimer said. The artists are guided by GCLA support workers Lynsay and Leeanne who work with the team to create inspiring artworks. Leeanne said while the group only met once a week, the success of the program during the short period since it started was evident. "It didn't hinder the amount of creativity produced in 2018, hence the exhibition was held, to celebrate the year's achievements," Leeane said. "There was no particular theme for the exhibition. "Some pieces were produced as a group and some were up to the individual on how they went about it. The result was a beautiful array of artworks that we are all very proud of." She said the year ahead had more exciting projects in store for the team. "We are planning some great projects for 2019, with the group's biggest goal to display their works in a public exhibition," Leanne said. "They also have plans in the pipeline for a group mural, all the while continuing to build their creative skills and expand on their portfolios." The Made by Me program is currently at capacity but people wanting more information on GCLA's various collective enterprises can phone Mellissa on 49728855 or email Mellissa.holzheimer@gcla.com.au.